California winemakers Helen Keplinger, Jordan Fiorentini, Annie Favia and Anne-Marie Failla find success with Rhône grapes. Two things were instantly apparent when senior editor James Laube led a panel of four winemakers onstage for a seminar on Rhône reds grown in California. First, this category has grown tremendously in recent years, judging by the lineup of wines—not just Syrah, but Grenache and Mourvèdre, grown in a diverse array of appellations. 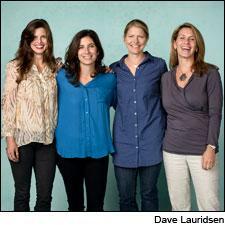 Second, women have arrived in California winemaking and will be shaping its future for years to come. Laube was the only man on stage. The Sonoma Coast has become known for outstanding Pinot Noir, but when Failla winemaker and partner Ehren Jordan visited, it reminded him of the steep hillsides of Cornas, where he had apprenticed with Jean-Luc Columbo. Ehren’s wife and partner, Anne-Maria Failla, presented their Failla Syrah Sonoma Coast Estate Vineyard 2009 (89 points, $62), and the gorgeous wine, with its fruit and minerality, proved Jordan was onto something. It might have helped, Failla explained, that the cuttings they used to plant the vineyard were “particularly close to his heart.” Jordan had smuggled them back from France in his shirt. Helen Keplinger found a passion for a different Rhône variety, Grenache, in Spain, where it’s called Garnacha. Keplinger has consulted for numerous top North Coast wineries, and she and her husband, Douglas Warner, own Keplinger Wines. In 2004, Keplinger spent time making wine in Catalonia, and she and Warner visited Grenache spots across Spain and France. Working in the slate soils of Priorat, she decided rocks were the secret of good Grenache. Her Keplinger Red Slope Knights Valley 2009 (93, $50), with a little Syrah in the blend, comes from a northern Sonoma vineyard with red clay soils littered with volcanic stones. Annie Favia spent 11 years working for David Abreu, Napa’s top grapegrowing consultant. Her husband, Andy Erickson, is a top winemaking consultant. At their own winery, they make Napa Cabernet, but the wine she brought was from humble Amador County—a Grenache, Mourvèdre and Syrah blend called Rompecabezas, Spanish for “jigsaw puzzle.” Intriguingly, the pair ferments the Grenache and Mourvèdre together in the same vats. The resulting wine, the 2009 (95, $65), is brawny and rich. Actress or pool boy, the wines these talented panelists shared show that California is becoming one of the Rhône’s finest appellations.